When Tony-winning director Kenny Leon staged The Wiz Live! for NBC last year, audiences tuned in to catch a talented cast in a multi-set proscenium space. When the cameras roll on Hairspray Live! on December 7, however, there won’t be a fourth wall. At times, there won’t even be the other three walls. Following The Sound of Music, Peter Pan and The Wiz!, Hairspray Live! marks the first of the Peacock network’s era of live musicals to shoot in Los Angeles on the Universal Studios back lot. When the cast of characters takes to the streets of Baltimore to sing, dance or march, they’ll do so without the confines of a proscenium—or a roof. With the new approach comes a new co-director: Alex Rudzinski, who won an Emmy for his technical work on Fox’s Grease: Live earlier this year. “It’s about trying to put the viewer in the heat of the action and trying to make them feel that it’s less of a proscenium production and more about placing the viewer right in the heart of that action,” Rudzinski said. “It’s a little bit like doing theater in the round,” added choreographer Jerry Mitchell. Part of creating that cinematic universe involves shooting outside, which will comprise about 40% of Hairspray: Live! (compared to Grease: Live’s 15%, by Rudzinski’s estimate). 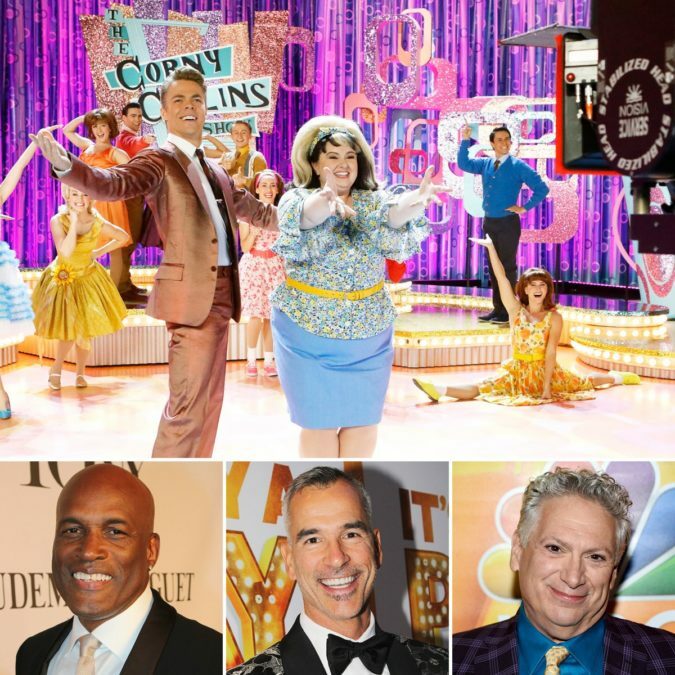 Like Grease: Live, Hairspray Live! will incorporate a studio audience—another first for NBC. But don’t expect to see audiences looking on in Tracy’s bedroom or in Motormouth Maybelle’s record shop. “I never wanted us to shoot the audience looking at the art,” said Leon. Rudzinski elaborated, “We’re being very cautious about making sure that when the audience is shown, it’s very much a part of the production.” Instead, look out for audience shots during The Corny Collins Show, the fictional ‘60s teen dance show. For Fierstein, the challenge is making sure the show’s high-energy attitude crosses through the screen. “If you’re watching at home, you could be in your underwear,” he said. “How do we reach you and tell that story, but still get you excited about life?" Leon will emphasize the show’s sense of history with “subtle visual suggestions that remind us that this may also sync up to us in 2016.” And though its themes of integration and acceptance are increasingly necessary, so is its upbeat sense of resilience: “This is an important opportunity for us to use theater and music in a way that can bring joy into the lives of Americans when they most need it.” That beat can’t be stopped. Catch Hairspray Live!, starring Maddie Baillio, Ariana Grande, Jennifer Hudson, Kristin Chenoweth and more, on December 7 on NBC.